This home won a Gold Award from the Wisconsin Chapter of ASID in 2002. The project began with a stock log home plan/kit that was adapted for use as a family vacation home. 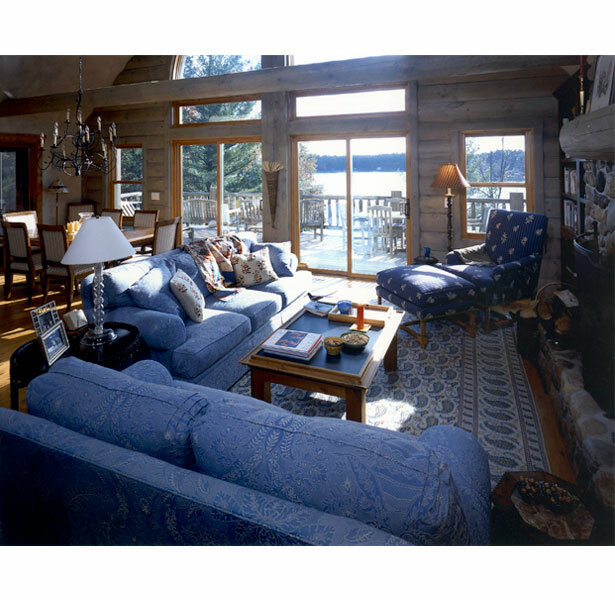 The owners wanted a place to enjoy life, with a coherent, guiding style not typical of log homes. The comforatable accommodation of guests, thoughtful storage, light, and outdoor views were the functonal priorities. A lighter, cooler palette reflects the water colors of the lake and the spirit of summer fun. A mix of American farmhouse and European rustic styles, using rugged natural materials, solidly stands up to all those logs. Here and there, a more delicate line in fabric, tile, lamp, or furniture detail is a domestic counterpoint to the rougher elements.